Masbate, and Guimaras, and formerly Ticao, in the Philippines. and a creamy-white buff tail with a broad black tip. The bill and casque are blackish; the former with yellowish ridges. 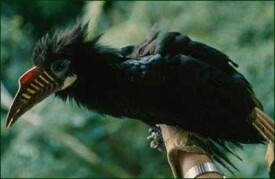 plumage of the female is black, and the ocular skin is blue. camouflaged by the dense foliage. The principal food of Visayan Tarictic Hornbill is fruit. It also eats insects, beetles, ants and earthworms (rarely). Visayan Tarictic Hornbill, Penelopides panini panini - Panay, Negros, Masbate and Guimaras. Ticao Tarictic Hornbill, Penelopides panini ticaensis - Ticao (likely extinct). Tarictic Hornbill chick surrendered to researchers in Panay, Philippines.This is a highly endangered species. the entire forest on the island was replaced by plantations and settlements in the 20th century. of hornbill to go extinct in recorded history; many other taxa in the family are now at risk.